SJMA Visitor Services Staff, Mark Winkworth, provides information to hunters at the hunting booth outside of the Colorado Parks and Wildlife Office. The booth is a partnership between the San Juan National Forest, Tres Rios BLM, CPW and San Juan Mountains Association. The booth will be staffed on Oct. 13, 18, 19, 20 and Nov. 2 and 3. 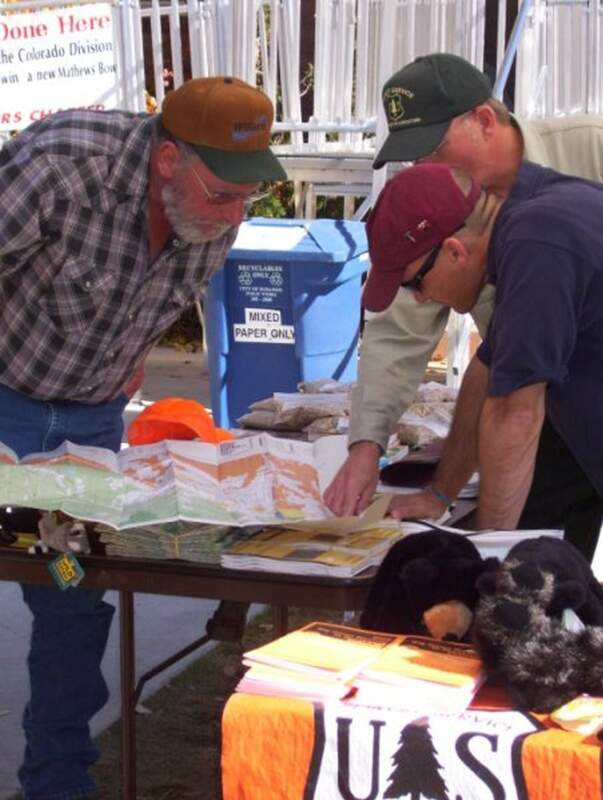 The booth also sells maps, guide books and OHV Permit Stickers. There’s a lot more to an enjoyable hunt than getting a license or taking a hunter’s safety course. Do you know where you are going to start your hunt and what the terrain is like? Where you can camp? Where you can use your ATV? When it comes to the land, the staff and volunteers at the Forest Service, Bureau of Land Management and San Juan Mountains Association can help answer your questions. Are you current on motorized travel rules for your local public lands? San Juan National Forest travel management continues to change. Check with your local office for current free Motorized Vehicle Use Maps or check online at www.fs.usda.gov/sanjuan. On the BLM Tres Rios and Gunnison Field Office lands, motorized vehicles are limited to existing roads. No cross-country motorized travel is permitted. And don’t forget that all Off Highway Vehicles must display either a current Colorado OHV Registration Form (temporary permit) or OHV Permit Sticker. Even if your Off Highway Vehicle is registered in another state, you are required to purchase a Colorado OHV Permit sticker. Registrations and stickers are available for $25.25 at San Juan Public Lands or Colorado State Parks offices. When traveling on an OHV, rifles and muzzle loaders must be unloaded and enclosed in a case, with no open ends. When setting up a hunter camp on public lands, proper planning will lessen your impacts to the natural world. The San Juan has some developed campgrounds that are still usable with a fee during hunting season. Also, on the Columbine Ranger District (ungated), campgrounds are still usable for a fee, but keep in mind that they provide no services this time of year. If you camp outside of a developed campground, please use a previously impacted area that is at least 100 feet from lakes, ponds, streams and trails. Never leave a campfire unattended and do not cut green trees or dig trenches around your tent. When it comes to trash, “if you pack it in,” make sure you “pack it out.” You should only burn trash that will be completely consumed. Foil, cans and glass do not burn and must be packed out. Please do not bury them. In national forests, it is prohibited to camp for more than 28 days within any continuous 60-day period. After 14 days, you must move your camp or equipment beyond three air-miles from the previous site. On BLM lands, you must move your camp 30 miles away after 14 days and not return for 30 days. Also, a campsite may not be left unattended for longer than 48 hours on the Tres Rios and Gunnison BLM. If you must leave your camping materials behind for safety reasons, such as a heavy snowstorm, please notify the local national forest or BLM office of the location and when you intend to return to pack out your camping equipment. If you use horses for hunting, help protect the land by using a highline, hobble or picket to restrain your stock, and always use tree-saver straps. It’s also important to tie stock at least 200 feet from any source of water. To help prevent the spread of noxious weeds, federal regulations require that you use only Certified Weed-Free hay, straw, mulch, cube or pelletized feed made from certified hay, or steamed-rolled grain for feed, while on public lands. Always make sure a friend or family member knows your itinerary for the backcountry. If you do not contact them at the agreed upon time, they can contact the county search and rescue through the county sheriff’s office where you are located. You will find top-notch visitor services staff and volunteers at the San Juan Public Lands Offices to guide you in your hunting preparations. Stop by your local offices in Durango, Pagosa Springs, Dolores and Bayfield, phone (247-4874), or email (info@sjma.org) with questions you have about the land. If you have questions about the hunting proclamation, licenses, or obtaining your hunter safety card, contact the Colorado Parks and Wildlife Office at 247-0855.